Australian teenager Alex De Minaur on his way to beating Milos Raonic at the Brisbane International. 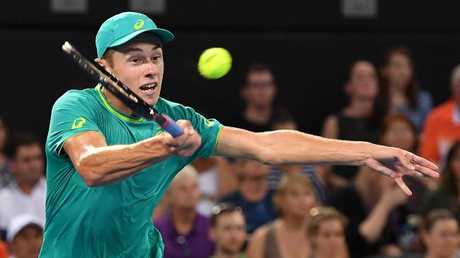 "BLOODY incredible" was how Lleyton Hewitt described Australian teenager Alex de Minaur's Brisbane International victory over No.4 seed Milos Raonic last night. The 18-year-old wildcard nicknamed "Demon" blazed into the quarter-finals with the biggest win of his career, a 6-4, 6-4 dismissal of the former world No.3 and 2016 Brisbane champion ranked 184 places above him. Hewitt has been a mentor for the Sydney-born, Spain-based teen whose tenacious playing style is reminiscent of the Australian Davis Cup captain's. 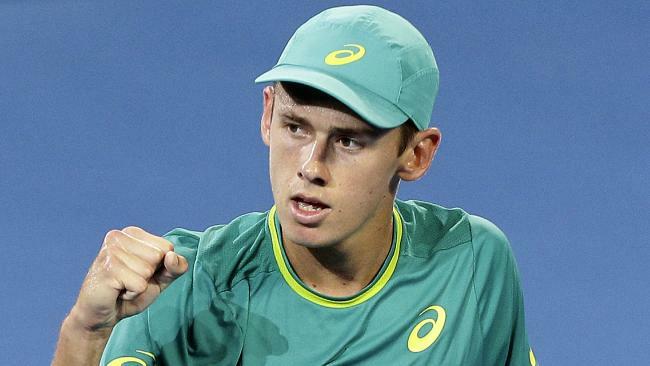 "One of the first things he ever told me was to believe in myself, that I've got a good enough game to be battling it out with these guys but it's all about me believing it," said the 208th-ranked de Minaur. "I think that's slowly happening." Asked what Hewitt - who had provided vocal support in de Minaur's player's box during the match - told him afterwards, the youngster said: "That was bloody incredible." Alex De Minaur on his way to beating Milos Raonic on Wednesday night. De Minaur's nimble movement and hard groundstrokes, which belie his slight frame, put the 2016 Wimbledon runner-up on the defensive. The Australian broke Raonic in the third game with a clean backhand winner. Raonic was able to dictate a point when he could bring his big forehand into play, but he found the mobility and counter punching of de Minaur a nightmare. De Minaur held serve for 4-2, with a backhand winner, a clever, deceptive second serve and a running forehand pass in the one game and he had the crowd roaring when he served out the set. Highly thought of for some time within Tennis Australia, de Minaur has reinforced this week what a good match-play brain he has. He defeated 44th-ranked Steve Johnson of the United States in the opening round and went up another level against Raonic. Milos Raonic hits a return to Alex De Minaur on Wednesday night. Despite missing two break point opportunities against the Canadian in the third game of the second set, de Minaur kept his composure, winning the next four games. With de Minaur serving for the match, Raonic put up some resistance, converting his third break point of the eighth game and winning the next to love. But, serving for victory a second time, de Minaur made no mistake, converting his first of three match points. He next faces 19-year-old Amercian qualifier Michael Mmoh, the world No.175 who upset eighth seed Mischa Zverev 6-2, 5-7, 6-4. "I've played him in juniors, I know him quite well, it's going to be a very fun match," de Minaur said. "Two young guys battling it out, you can't get much better than that, so I'm really looking forward to it and we'll see what happens."